This week the theme was Series I’ve Been Meaning to Start, but I couldn’t get to 10, so I changed it to finish. Which I think is more interesting. I really should just finish the last couple of novels of each of these series. I am hoping to buy the next books in the Runaways series in a couple of days during a trip to London. How is it there are so many series I never bothered to finish, when I cannot even stop reading a novel when I really hate it? No idea. 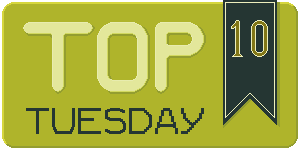 This entry was posted in Top Ten Tuesdays and tagged Adventure, Alexandra Bracken, Brian K. Vaughan, Cate Tiernan, Charlaine Harris, Claudia Gray, Comic, Fantasy, Kiera Cass, Laini Taylor, Lewis Carroll, Mystery, Romance, Sara Raasch, Science-Fiction, Top Ten Tuesdays, V.E. Schwab. Bookmark the permalink.